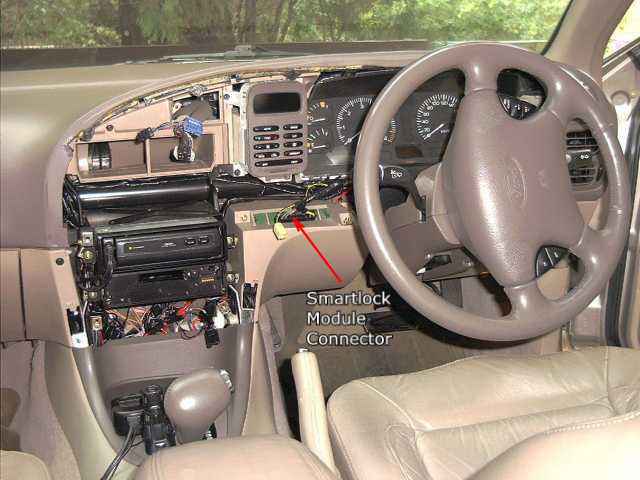 This Document describes how to add an Aftermarket Window Winder module, to the Ford Smartlock System, to enable the windows to be automatically wound closed, when the vehicle is locked from the Smartlock Keyfob. This modification ensures that the vehicle is secured properly when the Vehicle has been locked. The total cost of this modification should be around $25 per Window that is to be controlled. The Auto Winders cost around $50 a unit, but only control 2 windows per module. Obviously, for 4 windows, you will require 2 Winder Modules. The Modules are available from most Automotive Alarm Installers, Strathfield Car Radios, Ryda, and Possibly some Disk Smith Electronics Stores. Obviously, there are different Makes and Models of Auto Window Winding modules, with some having more fetaures than other modules, and consequently, different wiring configurations. This document describes the most common variety of Auto Winders, with none of the extra features being utilised. In order to understand how the Power Window Winder operates, it is important to understand how the Power Window Circuit works in the Ford Falcon. A power window consists of an electric motor, with 2 lines going to a DP3T switch, and finally a power and ground line going to the Power window switch. Basically, to get the power window to wind up, you need to give the power window motor power to one specific line power window motor line, and ground to the other power window Motor Line. To get the power window motor to wind the window back down, simply swap these two lines, (I.E. give the other Line Power, and Ground the Second Line). Now for the operation of the Power window switch. When the Switch is in the stationary position, both lines going to the Power window motor are grounded. This is very important, as most power window winder modules only connect to the motor up line, and will only give this line power, when the module is activated. This means that if the Switch did not supply Ground to both power window motor lines when the switch is not depressed, then the auto winder module would not work ! When the Power window switch is depressed in the Window Up position, the switch will give power to the window winder motor up line, allowing the window to wind upwards. If the Power window switch is depressed in the Window down position, then the switch will give power to the Power window Down line, allowing the power window to wind down. I mentioned earlier that the Switch was a DP3T (Double Pole, Triple (3) Throws.) switch. This means that there are 3 switch positions, and in each position, the switch will switch 2 lines. The Auto Window Winder Module operates on the above principles. Most modules will have 7 connectors, to control 2 Power windows. Obviously, if you wish to automatically wind up more than 2 power windows, you will require an extra module. Power (+12V) - Note this line will require around 20Amps, so make sure that this is run using suitable cable. 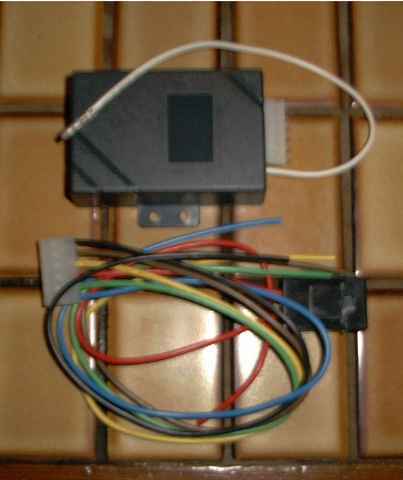 Ground (0V) - You can use chassis ground, or the Power window switch for this one. Trigger Line (Ground) - This is the Line that is connected to the Smartlock module, and is used to tell the Auto Winder Module to wind up the power windows. This Trigger line is always a ground triggered input. Power Window Motor Up Line (x2) To Motor - The Power Up Line is cut, and the end that goes to the Power Window motor is connected to this line. Power Window Motor Up Line (x2) To Switch - The other side of the wire that is connected to the power window switch, is connected to this. It must be noted that the line from the Power window switch, that goes to the up line for the power window motor is cut, and the line is joined to 2 other lines from the Auto winder module. When the Auto winder module is in the inactive state, all signals going through the Motor Up Line are simply passed through, from the switch to the motor. When the Auto Winder is active, all signals from the Up Line from the switch, are ignored, and power is supplied directly to the up line on the motor. The line is also cut to enable proper operation of the Motor Current Consumption (Current Sensing). Now for the theory behind Current Sensing. Current sensing is a method in Electronic Control systems, to determine when an Electric motor is developing the most torque, or consuming the most power. The way the Window Winder module works, it senses the amount of power that the power window motor is consuming, with the idea that an Electric motor will consume the most power, when it is under the most mechanical load. When the Power Window has reached the end of its travel, (I.E. Is completely wound to its upright position). When there is an obstruction that will not allow the window to completely close. When the Power window motor reaches this High Torque, High Current situation, all power supplied to the power window motor is halted, and the winder module is reset. The Power window motor is not overheated by unnecessarily powering the Motor if the window is already in the fully upright position. If there is an obstruction, such as a childs head, hands, arms feet, and teenagers butts, within the power window, the winder will automatically cut power to the power window motor, which will prevent any possible injuries to occure. As mentioned above, the Winder Module has a negative trigger input. This input will work with a very short pulsed negative signal, the same sort of signal that is supplied to the Central Locking Mechanisms, from the Smartlock module, as well as many aftermarket Car security systems. This is what makes this module ideal for Falcons with power windows. Quite possibly the best place to mount the Auto Winder modules, is under the main power window switches, in the centre console. This means that basically, all the Lines (with exception to the Power Line) are the neccessary conections that need to be made, are within easy reach. Hence you are not required to run long lines throughout the vehicle, to connect the module(s). 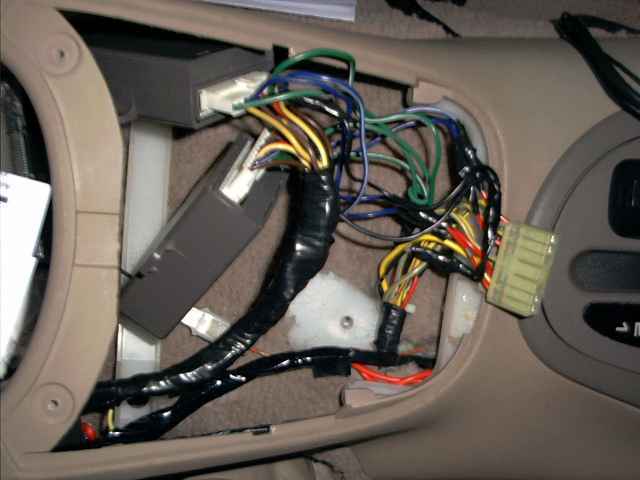 To get access to this area, you will need to remove the power window switchgear. 1. Open the centre console Lid. 2. Just under the Console Lid (when closed), there are 2 self tapping screws that hold the Power window switch gear in place, remove these 2 screws. 3. The power window switch gear can now be removed. Remember that you will need to unplug the electrical connector to do this. The Window Winder modules can be mounted within the cavity that is present along the sides of the centre console bin. (See picture for further information). Power Window Plug, Wire colour and descriptions. Grey/Yellow - If you have four power windows, there will be 2 Grey/Yellow Lines. The thinner Line is used for power to the Back Power window switches. The thicker cable is used to supply power to all the power window switches. As mentioned above the Power Window Motor Up lines need to be cut, and connected to the corresponding Auto Winder Module Lines. Once these lines have been connected to the Auto Winder Module, you will need to connect power and Ground to the Modules. You can obtain ground from the Black line, on the Power Window Switch connector, but the Grey/Yellow Power line will not be suitable for the module power source. This is due to the fact that this Line is controlled by the Body Electronics Module, and consequently, will not be active (Powered) when the Doors are Locked. The power line must be able to handle around 20Amps for 2 power windows, and up to 40Amps for 4 power windows. This means that these lines must be run from as close to the Battery as possible. Possibly the best place to get power for the Winder modules is from the Ignition switch Directly, due to the High Currents that the wiring for this switch can handle. Finally, once all these connections have been made, you will need to connect the Trigger Line from the Window Auto Closing Module, to the Smartlock Central Locking Lock Line. This Line is located on the Main Smartlock Plug, which is directly below the Climate Control / Heater Controls, beneath the Dash Plastic. Yellow / Black - Smartlock Central Locking Lock Line. This is the 3rd Wire from the Left of the Plug, on the upper row, and is next to a Red/Yellow, and a Black Wire. As mentioned before, this line is a negative Trigger Line, that is the Smartlock Module will ground this line for a period of aorund 1 second, to lock the Central Locking System. The Auto Winder Module will sense this line being grounded, and if all is connected well, will begin to automatically close the Power Windows. NOTE : The Above wiring will also close the windows when the Doors are manually locked using a key, or when the Door Lock/Unlock Button is depressed. To disable closing the Power Windows when the vehicle is locked using a key, you will then need to install a Diode inline with the Smartlock Central Lock Line, with the Cathode end of the Diode going towards the Smartlock Module, and the Anode going away from the Smartlock Module. Finally, the Connection to the Auto Winder Module should be made between the Diode and the Smartlock Module. The Diode Installation prevents the Auto Winder Module from seeing any Negative Triggers on the Central LOCK line, that are made by anything other than the Smartlock Module. Document written by: Matti on 26 2002>, Copyright © 2005 Matti, all rights reserved.